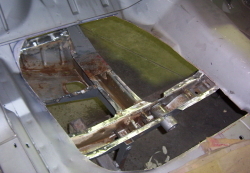 Repair section being formed for floor pan, a paper template was made to show the position of the swages and folds from the drivers side floor and the remains of the passengers side floor. 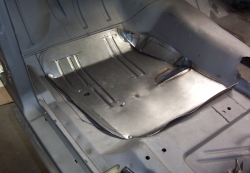 Before the floor was welded in the rails were repaired and cleaned up inside. 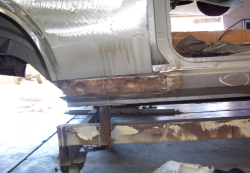 After treating the insides of the rails with deoxodine they were brushed with red oxide primer to protect them,the flanges were left bare for welding. 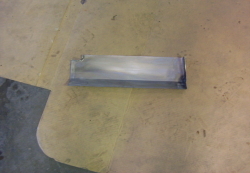 Section welded in and ground back,before bing disk sanded and deoxodined. 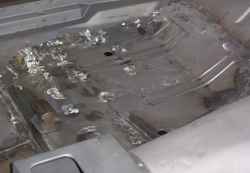 Drivers side rear quater ,both sides were rusted like this fortunatly the inner panel was not very bad and cleaned up with metal conditioner. 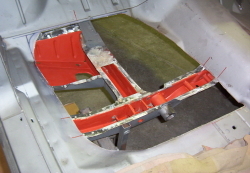 New panel made for the quater both sides were made from the one template, red oxide primer was applied behind the panel both on the car and the repair section to help prevent rust. 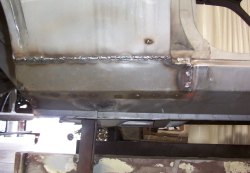 Section welded in before grinding and sanding. 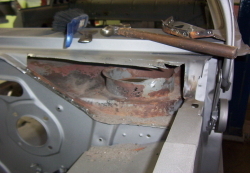 The scuttle on the passengers side was paper thin the drivers side was not much better.